San Diego Chargers players and coaches are often interview on the local sports radio channels. Sometimes I listen to the interview and take notes. 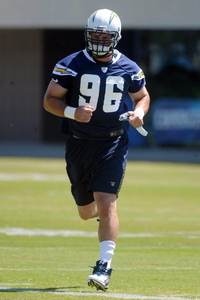 Today, when new Chargers LB Jarret Johnson joined the Darren Smith Show, is one of those times. Jarret is renting a house in San Diego, but his wife and daughter (who are in Florida) aren't planning on coming out until the season starts. "With all the change, I feel like a rookie again." Jarret feels fresh, rejuvenated. Says that he got a little too comfortable in Baltimore. Norv Turner is "definitely more hands-on" with the Chargers than John Harbaugh was with the Ravens, especially with the offense. John Pagano and Chuck Pagano are a lot alike. "Both great personalities and both know football." The scheme of John Pagano's defense is very similar to what Chuck Pagano was running in Baltimore, although Jarret seems exhausted when he talks about trying to learn all the differences in verbiage. "On defense, you want a mix of young, athletic ability and veteran leadership.....and that's what this team has." You know what? He's right. Johnson already knew how athletic Shaun Phillips is, but was surprised to find out how smart he was. Jarret just mentioned Larry English for the third time. Right when I was about to write about hearing a bit of excitement in his voice, Jarret comes out and says "In my opinion, Larry is a beast. The guy looks great." Interesting to hear Jarret say that Antwan Barnes can play "any position on the field". "I hate meetings, I hate the other things that come with it, I hate conditioning....but I love to play football." 2012 NFL Free Agency Weekly Recap: How did the Miami DolphinsÂ do? A Fond Farewell toÂ "J.J."
Sign in with your Yahoo! ID Add Bolts From The Blue to My Yahoo!